So you’ve started your business. You’ve got the website, you’ve got the graphics and fancy branding, and you’re now ready to connect and push the concept live. So you sign up for all the social media platforms you can think of, start posting pictures of your logos and follow Richard Branson and any other famous people you can think of. Fast forward two weeks and you’re frustrated nobody has noticed you. You’ve hit a maximum of a few likes a post, and no matter how many accounts you’re following and supporting, you just aren’t gaining followers. If this sounds familiar, then don’t worry because you’re not alone. 86% of start-ups take to social media to market themselves, and there’s good reason for this. With 328 million monthly users on Twitter and 1.2 billion on Facebook, it’s the only space imaginable where you can talk to such a large audience. That’s if the audience are listening. In 2017 you’re competing more than ever to not be a tiny fish in a huge sea of users. We’ve devised the top tips all start-ups should be adhering to when it comes to their social media set up, to help small businesses get heard online. Not all platforms are necessary for all businesses. You need to do some research into where your audience are. For example, if your target audience are over 50’s, it’s unlikely you’d need to invest time in an Instagram account seeing as a whopping 90% of users are under 30. You also want to think about what each platform is doing, for example Instagram and Pinterest are primarily visual, ideal for a creative business. The Pew Research Center has an excellent breakdown of where your audience spends their time online. It’s not difficult to find studies and infographics that provide information on specific platforms or other countries. Optimising your accounts should be the first thing you are doing once signing up. That means having a relevant and professional icon/profile image, such as your brand logo or anything that clearly makes you recognisable as you. We will be talking more about brand image and professionalism later, but it’s important to straight away set the benchmark by matching your branding and image on social media to your website. Platforms such as Twitter and Facebook are now also offering the option of a cover photo- which is a further chance to translate who you are in an image. Bio’s are also easily overlooked. There’s not necessarily rules when it comes to this, but to stay safe, going with your location (not exact address just e.g, Cambridgeshire) and a quick sentence or two summarising who you are and what you do, will always be a winner. There’s room to get more creative with a bio once you’ve found your feet a little on the platform. 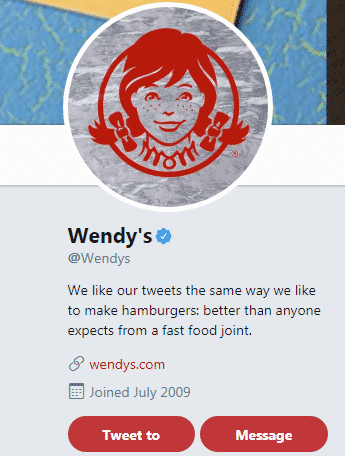 Take giant fast fooders Wendy’s for example, they have a fun yet informative bio. They’ve also matched their background cover photo really nicely with their logo- and even chosen their profile theme colouring to be red, to match with their brand colours. Never forget to utilise the space for a link to your website also! Following real accounts run by real people who are c aring and engaging in the same ideas as you, is the key to gaining back legitimate followers. It’s tempting to just spam follow a bunch of accounts, as statistically, you will get follows back, but this is never a good idea in the long run. Not only will your account get disabled if you follow vast numbers of accounts in a short space of time, you’re also not gaining an interactive audience. An interactive audience will be the key to using your social media for business success (We will be covering why your follower count shouldn’t be your top priority in a bit) and should be the focus point of gaining followers. Finding those who care, can be also be as straight forward as searching for key terms on the platform, and looking at accounts that have tagged or used this word in their profile or images. 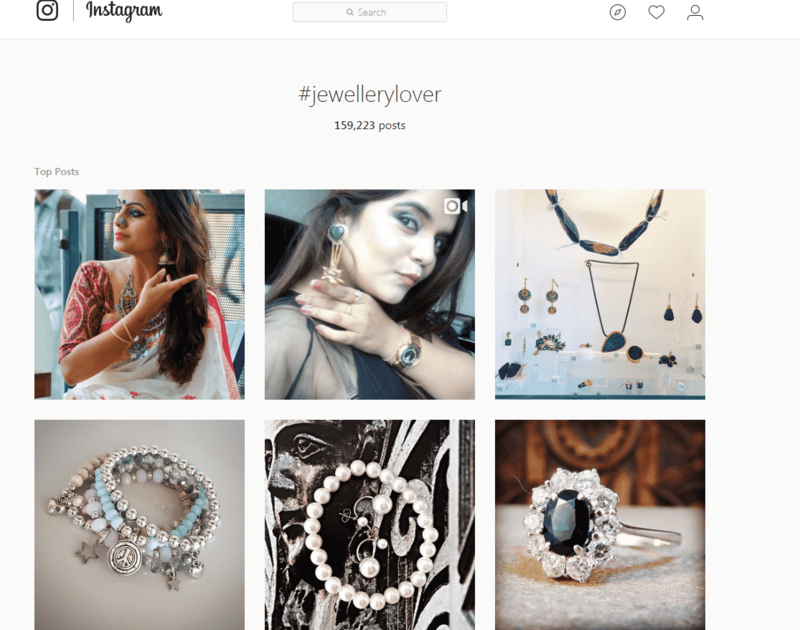 For example on Instagram, if I’m a jewellery shop, I may be searching for hashtags such as ‘jewellerylover’ then following some of those accounts that have used it, as they clearly are into jewellery and may thus be interested in the jewellery i’m selling. There are some great tools out there to help you do advanced searches further to get to your right audience such as Moz’s Followerwonk, who we’ve written a whole article on. With this tool you can investigate your own audience, potential audience and your competitors. Bare in mind your location too. Even if they aren’t directly related to your business, you want to be following your local newspapers, magazines, clubs and groups on social media so you can become part of the community. Many towns have their dedicated Twitter page that re post and engage with local businesses. You also want to be paying attention to the top dogs in your industry and supporting and following them. What they are doing is clearly working. You can also use this as a chance to nab some of their followers, who if they like your competitor, you know are going to like you. Again, we covered more on how to do these sort of tactics here. Spend some time browsing relevant tags and pages for your business that help you find your audience and learn what the experts are doing. No spam following and liking. This includes automated tools that do this! It can be easy to judge your success on a channel based on your follower count, but it’s vital to remember that having loads of followers will not necessarily mean more engagement, if these followers are not those that are going to care about you. As we mentioned earlier, statistically if you’re following a huge number, you will get some followers back. What is important, is focusing on the engagement of these followers, and what ( content, posts) makes them engage with you. Paying attention to the content that works, could mean it takes one re tweet from an influencer to gain you lots of valuable interactive followers. We all remember when Kim Kardashian replied to a fan on twitter and he soon gained 200 thousand followers. Yep you read that right. Granted, Kim does have 55 million followers, but the point remains that it can take one moment of notice to change your whole following. This won’t be happening by having loads of spam followers, but through creating content that is inspiring and that gets you noticed. An organic audience will also be an audience that are caring and clicking through to your website, which is arguably part of the main focus of having social media for a business in the first place. The key to creating content on social media that will get engagement, is understanding what sort of content your target audience are loving. If you know their demographics as we discussed earlier, this will make this part of the job a lot easier. Using the analytics tools available on your platforms is the most accessible and often insightful way to gain information on your audience and their engagement with you. 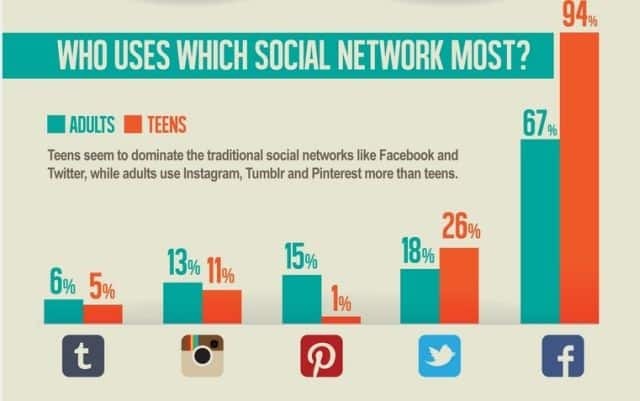 We love this infographic from Hot In Social Media which summarises the channels adults and teenagers spend most of their time on. There’s a lot of data like this out there that you can use to make decisions. Tracking the behaviour of your audience is also key to understanding them. For example if at a particular date you tried particular tactics of imagery or memes and this gained you more views, re-tweets and click throughs- then you know that this sort of approach can work again. Regularly checking your analytics to see progress will be the key to working out what you can improve on. As well as understanding your audience, listen to what trends and news are taking place online also. Track popular hashtags and events, so if there’s an opportunity for you to jump on and join in, you can go ahead and increase your reach. Your audience may be also frequently using certain trends so it’s worth bearing these in mind and tracking them. The most successful social media accounts tend to be the ones that feel the most natural and personable, but clearly also have a structure and know what they are doing. Scheduling content with tools such as Buffer and Hootsuite allows you to plan ahead and have automated content regularly coming from your accounts. We are personally a huge fan of Buffer, as it’s easy to use and simple. You can also track the results of your posts too. This can be a great way to stay organised, but it has to be done right. Content scheduled at the same time, everyday, saying the same or similar things can appear spammy and robotic. Social media is so loved because it’s where people ‘hang out’ and relax a bit more, so you need to have this approach too.By all means, using scheduling tools can be a lifesaver to save someone from remembering to tweet or to plan ahead for that lead up to a big event. Scheduling will become easier, when there’s a strategy in place. This should be outlined before anything is going live on your social media. If you have multiple team members contributing to the social media accounts, they all need to understand this too. Strategy in what you’re going to say, how you’re going to say and what is off limits, is vital to protect brand image and what you stand for. You need to remain streamlined to your brand identity as a company on social media. Sure, it’s a space to be more personable and friendly, but you don’t want to appear a completely different brand and drop everything you stand for. We’ve done a whole article on brands that have made these sort of mistakes, and they certainly payed the price. Once you’ve outlined what is acceptable, you can get more technical and start to devise actual content strategies. Important points to help devise a strategy will likely include points such as current affairs. What big events are coming up for the world or for you as a company? Alongside this, what is your business trying to achieve or push out right now? Once you’ve answered the sort of questions your marketing team are talking about a lot of the time, you can get creative and start thinking of content to correspond with these ideas. Once you’ve got your content thought out and scheduled, you can think about how you are going to push it. There is no more annoying feeling than spending time creating quality content for it to go unnoticed. We’ve talked about how this is unlikely, if you have the correct followers and are using content strategies effectively. However, sometimes there are some promotional tactics that can be undertaken to speed up your engagement. Most platforms offer their own version of advertising. These adverts which are designed and launched within the social media platform, often allow you to target specific groups of people so you can pitch to your exact target audience. You can choose your budget and a time length for the advert, and also track the progress and click throughs the advert received. These can also be particularly useful if you are trying to encourage your followers to spend some time on your website, as you can design the adverts to allow users to click through to pages on your site. Organic ways to gain promotion can be as simple as getting the right people to repost your content. As we’ve seen, all it takes is an influencer to notice you, and your account can instantly explode with engagement. Talking directly (@ing) to influencers can be difficult however for obvious reasons, but the best way to get in front of people will always be by producing original and genuine content that carries a message and inspires others. It’s human to want to share what you love, so create content you know will be enjoyed. We think we’ve covered the basics here to get you started, but be sure to keep an eye out on our blog for in depth pieces on mastering social media. We hope you’ve been inspired, and remember, if any of this seems overwhelming – Edge are here to help. With experience in social media marketing for a variety of companies, we love nothing more than getting stuck into a new social media campaign. Are you capable of creating award winning designs? Are you comfortable in front of clients? Is Web Design something you love? If the answer to all three is yes then you may be what we are looking for, contact us.